Ah, weddings – the joyous, official ceremony for two individuals deeply in love with each other. You’ll need some funny marriage advice too to make everyone laugh! Like the vow says, ‘in sick and in health, till death do us part’. Well, at least a short part of it says that anyway. Here’s what you can expect at weddings – wedding vows, wedding toasts (not bread! ), good food and some light partying. Perhaps you’d even find some champagne and wine to add to the occasion, although that is fully dependent on the couple’s preference. Of course, like all other starting of marriages, you are going to need some unique and special wedding quotes or messages to spice it all up. You can have these on wedding cards, on a mini blackboard as your wishes to the couple, or simple as a light-hearted wedding toast that you can give them! Alternatively, you might be needing some marriage advice from your elders before you walk down the aisle. Psst, even if you’re the groom looking for inspiration on what to say for your wedding speech to your wife, we understand! Whatever it is that you’re looking for, you can take a look at the list of funny marriage advice and quotes below and bend it to your needs! 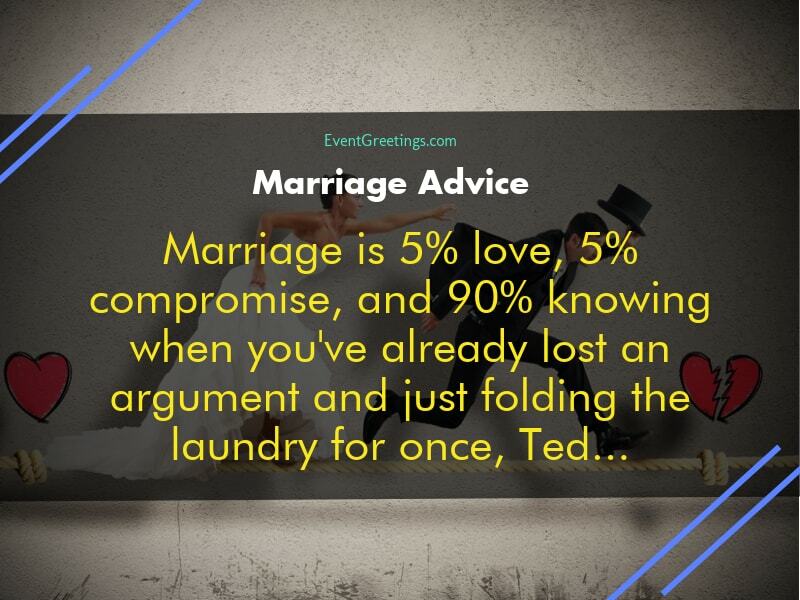 Here are some funny marriage advice and quotes you’ll love. Marriage Tip: Bad Day? Starbucks Need to apologize? Starbucks Last minute gift? Starbucks Lost the kids? Marriage Tip: Never respond to a question that starts with “I need an honest opinion…” unless there are clean sheets for the guest bed! Marriage Tip: Marriage is all about “What’s mine is yours” with the exception of the iron curtain that divides sides of the bed. Marriage Tip: Change your scale units from pounds to kilograms to lose half your weight overnight! Marriage Tip: Everyone’s shower is cold if you’re the only one that knows how to fix the water heater. Marriage Tip: Posting pictures of sentimental gifts to Facebook lets you remember what/when you were given an item by your spouse!